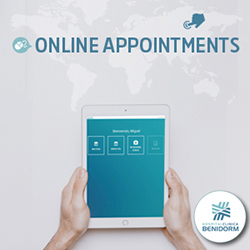 Personalized, comprehensive attention for patients who come to Benidorm for cardiology treatments. Our Cardiovascular Institute is made up of a multi-disciplinary team of doctors who comprehensively cover cardiovascular pathologies. It is our aim to offer each patient the treatment most suited to their needs, making an interdisciplinary evaluation of all the possibilities. All the professionals involved can accredit national and international training in different fields of spinal pathology. The unit is made up of its own administrative staff, Neurologists, Neurosurgeons, Rehabilitation Doctors and Pain Specialists. HCB offers solutions for obesity through a multi-disciplinary team coordinated within a hospital environment: endocrinologist, internist, Psychologist, nutritionist, endoscopic surgeon for fitting intragastric balloons and, for patients with morbid or complicated obesity we offer surgery if the case requires it. On the basis of complete initial study, the most suitable treatment for the patient is evaluated. 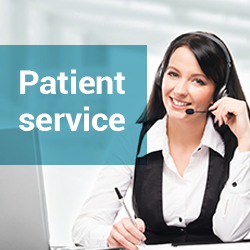 For the patient’s convenience HCB has designed a preferential circuit for carrying out all the necessary tests in the same place and on the same day, constantly accompanied by the centre’s staff and by an interpreter if necessary. The ‘Knee and Hip Programme” at Hospital Clínica Benidorm combines the necessary medical treatment of the hip or the knee and their rehabilitations with a holiday on the Costa del Sol for the patient and a companion. Our programme is designed for people who wish to undergo an operation which is suitable for relieving knee or hip pain without having to put up with waiting lists and with quick recovery time and supervision by professionals promoting health and well-being. The programme has the best collaborating staff in the area, such as the “Medifit” rehabilitation centre, where the main rehabilitation programmes are carried out after surgery, and the “Ciudad Patricia”, adapted residential centre, where the patient can go to combine rehabilitation sessions with a lovely holiday on the Costa Blanca. Furthermore, you can book your stay with special prices in three, four and five-star hotels or book a luxury villa in Moraira. The programme, which includes intensive rehabilitation lasts from three to four weeks, which is sufficient time to allow the person to return to his or her normal daily life, totally recovered and free from pain. Following the HCB model for international patients, the “hip and knee programme” has its own medical, rehabilitation and administrative team for each nationality and makes organizing the trip easy, from both a medical and a leisure and vacation point of view. 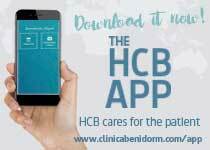 The HCB Dialysis Centre is an advanced dialysis unit which is part of Hospital Clínica Benidorm (HCB), at the heart of the Costa Blanca (Spain). The centre offers patients with dialysis treatments exclusive facilities with the most advances technology, and international and multilingual team and more than 40 Medical Specialties for inpatients, emergencies and polyclinic. The work of the HCB Dialysis Centre is oriented towards patients who are resident in the area, temporary residents and especially people wishing to spend their holidays on the Costa Blanca. The very best specialists study each case, in order to offer personalized solutions for each case. The Regenerative Medicine Unit is one of the first private centres of its type in Spain to use plastic and regenerative surgery with adult stem cells from adipose (fat) tissues to generate various types of human tissue, so giving a natural alternative to traditional surgery. Hospital Service which is formed by specialist doctors in all the medical and paramedical disciplines dealing with the face, mouth and neck, from bone to skin.